I am greatly honoured to stand here today to announce Namidia’s support to the players of our national soccer team, the Brave Warriors. Ladies and gentlemen, There is something to be said about playing for your country; wearing the national colours and knowing that you represent a nation of some 2 million people every time you run onto that field to face an opponent. As an ambassador of our country and with the technological advances of today, your every move – your facial expression, your body language, your attitude and your spirit of sportsmanship – is visible for the world to see and criticize. Not only do you have to perform at your peak for ninety minutes but for that period you have to behave exemplary as a representative of this country known as the home of the Brave Warriors. And we can surely appreciate that this cannot be easy. Freedom of expression in Namibia allows us all to be so-called “sofa coaches” – meaning that everyone has an opinion on individual players’ performance, the team performance and ultimately the coach’s decisions. Often this comes with very harsh and unflattering criticism. And we at Namdia know a little something about harsh, mostly unwarranted and often unflattering criticism from so-called “sofa diamond experts” who had taken upon themselves to publicly tear us apart, perhaps not realizing what Namdia can mean to this country. But we have had to endure, fight criticism, sometimes with silence and sometimes with a battle of wits in the media. And just yesterday we declared dividends to our shareholder – the Government and people of Namibia – to the tune of 50 million Namibia Dollars, from just two years of existence, proving that Namdia is an important vehicle for the socio-economic development of this country. As players, you have huge shoes to fill. You walk in the shadows of those (remember that squad which included our coach?) who captured the indomitable spirit of Namibia in the 1990’s during our first venture onto continental football. Some of you are part of the team which against all odds became COSAFA champions some two years ago, making the nation stand up, take notice and had detractors swallow their words. 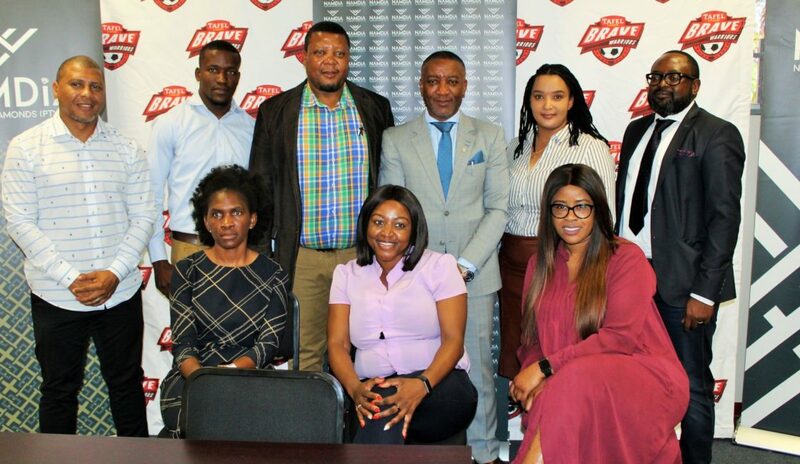 This is a total sponsorship of almost eight hundred thousand Namibia Dollars, which we are confident will serve as an incentive for the players to perform at their peak, to once again push this nation through the the greatest sports contest on the continent. I would wish to make it categorically clear that this sponsorship is directly to the players and we are confident that there will be no backlashes relating to this. 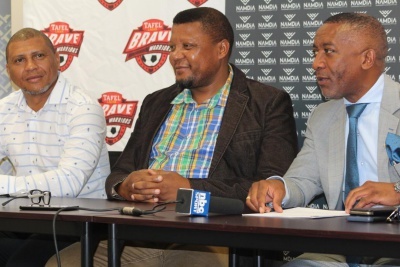 As Namdia, we have committed ourselves to assisting the players achieve their best and have no desire to be caught up in any of the domestic squabbles which has characterized the administration of soccer in this country for a long time. We pray and hope that this would come to an end sooner than later for the greater good of Namibian football and all Namibian soccer lovers. We are very aware that our players have been enduring tough times whilst at the same time carrying the national flag of our beloved country. It almost brought my management team to tears when Coach Mannetti narrated how players have to sleep on benches whilst in transit to far away, hard to reach, destinations on national duty. It’s sad to be told that some of our players cannot even afford to go buy food for their mother or a birthday present for their loved ones. This sad state of affairs is unacceptable. We need to make our players proud to carry our national flag. But we cannot allow them to continue running on empty stomachs. We would finally like to wish the coach, Ricardo Manetti and his technical team the best of luck in the following few months as they go into battle to qualify for the African Cup of Nations 2019. I would in particular like to pray for God’s Grace over each and every player and staff in the Brave Warriors squad and implore you to go out there and make us proud. We can do this – we stand on the shoulders of giants so let us ourselves become giants! With these few words, I thank you.